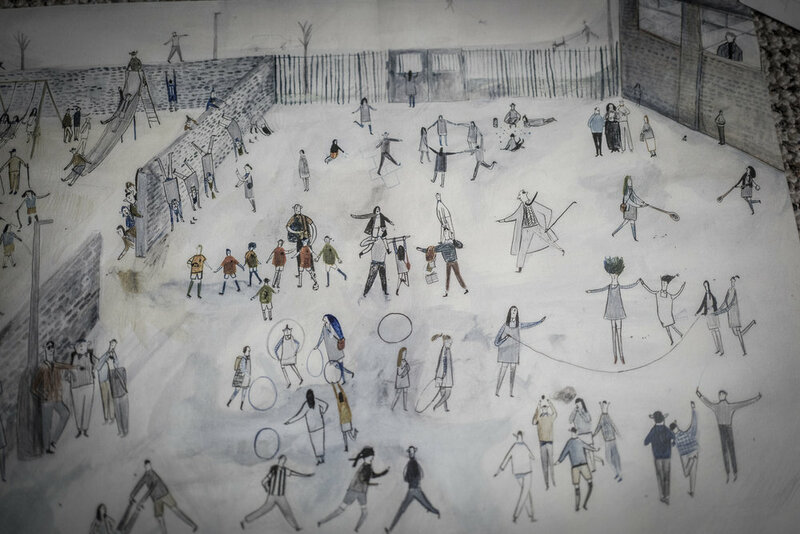 Despite spending her early years avidly writing and drawing pictures for her own stories, Maisie Paradise Shearring didn’t consider illustration as a career option until a few years ago when studying on an art foundation course. Since graduating from Edinburgh College of Art and gaining a distinction for her MA in children’s book illustration at the Cambridge School of Art, she’s worked hard to develop her ethereal and evocative style. In 2015 she won the International Illustrators Award at the Bologna Children’s Book Fair and as part of the prize she was asked to illustrate a classical children’s tale. She chose The Happy Prince and created a magical adaptation of Oscar Wilde’s classic tale, that she describes as “a timeless story and also a book of its time.” This year she is celebrating as books bearing her name hit shelves around the world. I caught up with the Cambridge-based illustrator to talk about the influence of Ethel and Ernest, exploring mixed media and editing Oscar Wilde. Claire: Did you always want to be an illustrator? Maisie: No, as a very small child I loved making my own stories and drawing, but I never realised a job as an illustrator existed. Whilst I was studying on my art foundation, a year long course where you try out lots of different things like textiles, photography, fine art and art history, we studied a module in illustration that I really enjoyed. When I was applying for university, my tutors encouraged me to study illustration because I was always wanting to tell stories with my drawings. From then on I wanted to be an illustrator. Claire: Could you describe the moment you first looked at someone else’s illustration and it moved you? Maisie: I think it would be Ethel and Ernest by Ramond Briggs. I love Raymond Briggs’ work and in this book I love the dialogue between Ethel and Ernest. It is a celebration of a companionship and love, the ups and downs of family, but also incredibly sad as it spans them meeting to both Ethel and Ernest dying at the end. The pages where Ernest is still chatting to Ethel after she has died and the quietness of the rooms and panels (in comparison to the much busier spreads in the rest of the book) is heartbreaking. It is very well observed. Even when I look at the spine of this book on my bookshelf I could cry. Claire: Which medium do you use and why? Maisie: A mix, but the ones I regularly use are, pencil, crayons, ink, watercolour, gouache and bits of collage. I like the feeling in my work that using mixed materials creates. I like trying to create contrasting qualities in my artwork and I find using mixed materials helps me to explore these contrasts. Claire: Where do you find your inspiration? Maisie: I find inspiration from wandering around looking at things and people watching. I also find inspiration when I switch off from a project I am working on and draw in my sketchbook for fun. If I go out and do some observational drawing that is often when an idea will start to form for something new. Claire: What was the last exhibition you went to see? Maisie: The last exhibition I went to see was quite a while ago now, it was when The Turner Prize came to Ferens Art Gallery in Hull during its City of Culture year. This meant a lot, as I am from Hull, and would never have thought an exhibition like this would be in the Ferens Art Gallery. Claire: You grew up in Hull, how do you feel when you go back there now? Maisie: I had the best time growing up in Hull and it still feels odd when I call other places home. As a child it had everything I wanted there but when I moved away I realised how good it would have be if more music, exhibitions and events were hosted in Hull. This is why the year of the City of Culture was such a big and positive time for the city. I really hope the positive impact it had continues and grows. I love going home, especially because it means seeing my family. Claire: Do you have any art icons? Maisie: I have a huge list, but off the top of my head, Carson Ellis, Jillian Tamaki, Ben Shahn, John Burningham, André François and Christian Robinson. I am also inspired by my creative friends who make incredible work, which always makes me reflect on my own creative practice. These include Hannah Webb, Katie Harnett, Becky Palmer and Pam Smy. Claire: Which creatives do you follow online? Maisie: I enjoy following Dave Shelton on Twitter (@DaveShelton) I like how when I read his tweets I can hear the sound of him saying it. I think it's quite tricky sometimes with social media to still sound like you. I like following Katherina Manolessou on Instagram (@kmanolessou) seeing her drawings always make me very happy. I think you can see so clearly how her inspirations around her feed into her work. I also love seeing what Emma Farrarons is drawing on her Instagram (@emmafarrarons) I love seeing pages from people's sketchbooks. Claire: Do you think your drawing skills deteriorate if you don’t practise or have you never stopped to find out? Maisie: I haven’t ever really stopped for long enough to find out, but I think they definitely would. Although, actually, I spend a lot of time drawing kids, so now I’ve realised I am quite rusty drawing adults and need to go out and refresh that skill. I draw from life and also spend lots of time doodling in my sketchbook and imagining characters and drawing them in different situations. If I am stuck when I am drawing from imagination, I will go out and draw from life to try and solve the problem. I like walking around and seeing things and thinking about how I would best describe that on paper. Claire: Do you get lonely or is there a camaraderie amongst fellow illustrators? Maisie: I actually like working alone in my studio, but there are lots of illustrators in Cambridge who I do see regularly. If there weren't so many illustrators in Cambridge I might feel more lonely. Claire: Why do you want to communicate with children? Maisie: I think picturebooks are a great way for children to first explore the world and I like the idea that possibly my book will be the first time they have thought about something before. I like making picturebooks as the images can be as, if not more, important than the text and so I love thinking about what I can add to the story with my images. Claire: How does it feel to watch a child read one of your books? Maisie: Exciting and then a little nerve wracking, in case they just flip to the end or wander away bored! Claire: Why do you think reading to children is important? Maisie: There are an endless number of stories, with endless interactions, emotions, characters and situations. I think it is amazing as a child to listen to a story and think about all these different things. Getting really lost in a story is the best feeling. Claire: What do your parents think of what you do? Maisie: I am very lucky as my parents have always been very supportive. When I was studying my a levels I considered going to study History or English at university because maybe it would be easier to get a job and I remember them saying I should do the thing I truly loved. Claire: What or how do you feel when you are drawing? Claire: Was there a moment that helped you break into illustrating as a career? 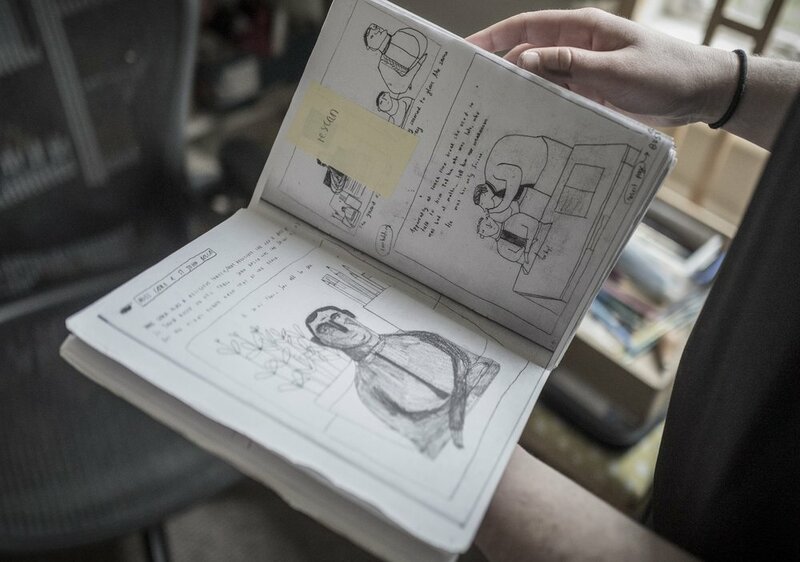 Maisie: In 2015, I entered five illustrations from a graphic novel I was working on at the time, called Susan's Schooldays, to the Bologna Illustrator's Exhibition. I remember how happy I was when I found out I had been chosen for the exhibition, so I was over the moon when I won the award. I don't think there could be anything that ever really matches this feeling. It was at a point where I was unpublished, working in two jobs alongside my illustration, and it gave me the best possible break into working professionally as an illustrator. It still feels very surreal that it actually happened! Claire: As part of the prize you were given the opportunity to illustrate a book that would be published and given free rein over what that title would be. What made you choose The Happy Prince? Maisie: I thought the themes in the story were really beautiful. I knew it was a story that was well loved already but I thought it was a good choice to adapt for a picturebook, so that a new audience of children could hear this story and think about the messages in it: of being kind, the value of friendship and caring for each other, of class divides and how appearances can deceive us. It also felt such an honour to able to illustrate the words of Oscar Wilde for my first book! Claire: How did it feel to edit him? Maisie: It felt very, very wrong at the time, but now I think it was the right thing to do. I don't think the story was written and intended for a picturebook. I edited it as a way to adapt it so the pace and structure felt more appropriate for a picturebook format. I thought a lot about adding details in the illustrations so that there are a lot of other little stories going on in the images. Claire: Were there any differences between making The Happy Prince and subsequent commissions? Maisie: Lots of differences. Firstly, The Happy Prince was quite a different story to the type of story I would usually write or illustrate. Usually I think of stories inspired by what’s around me, or from my memories of childhood. It was also quite tricky to decide how to break up the book into a picturebook and which bits to choose to illustrate. It was also a much shorter deadline than subsequent books I have worked on. I think I made it in about 3 months, and I went straight from very rough pencil drawings to working on the final artwork. Usually I spend a lot longer experimenting and thinking about the materials and how I will create the final artwork. With The Happy Prince, I was just working it out as I went along. Working this way means I think there is an energy in the work that it is often harder to retain when you have edited and thought about an image for a long time. The picturebooks I have worked on since The Happy Prince are all intended for a younger audience too, so I think have a different feel because of this. Claire: Do you have you any advice for other illustrators starting out? Maisie: Draw all the time. Start by drawing from life every day. And challenge yourself to draw everything. Draw buildings, people, children, animals, people moving and difficult perspectives. And don't spend too long looking at how other illustrators do it as you want your work to be you. Try to think of what inspires you (outside of other people's picturebooks and illustrations). Claire: What do you tell your students is the most important thing to know about being a good illustrator? Maisie: I think to be a good illustrator you can't be lazy, you have to be incredibly driven and passionate about what you're doing. There are lots of things I miss because of my work, I regularly work every day of the week. Claire: How do you work on developing a character for a book? Maisie: Lots of my story ideas start with the character before I know the story. Often it starts when I am drawing from life and I draw a person or child, then continue developing them into a character when I'm back in my studio. Sometimes they will still end up quite similar to the person I saw, but sometimes just some of the details will remain, like the clothing or hair. 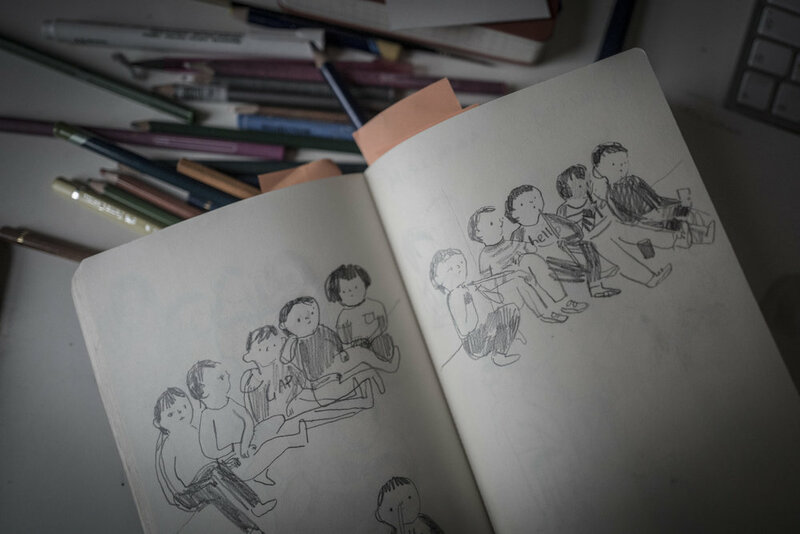 Back in my studio, and from my imagination, I draw that character over and over, doing lots of things like brushing their hair, tying their shoelaces, cleaning their teeth, or in a supermarket and introduce them to other characters. This helps me to get to know them and think about how they would behave in all these situations. I learn all about them until they feel ready for the story. Claire: How do you know when a character is fully formed? Maisie: I think when I can answer any question about them. Claire: What are you working on next? Maisie: At the moment I am working on my next picturebook (as both author and illustrator) with Two Hoots. I am also currently illustrating a picturebook text, by Jane Porter, for Walker Books. I am having lots of fun doing this. It is a story set in a nursery and I love drawing children. I went to the nursery in London that the story is based on to draw the children. It was a wonderful experience. Claire: What do you think you’d be doing you weren't an illustrator? Maisie: I love working with people and teaching. As well as being an illustrator, I lecture at university and I am also co founder and tutor at Orange Beak Studio. Orange Beak Studio is a creative collective of illustrators and designers who offer tutorials, workshops and events for illustrators. We are currently organising our first illustrators retreat. So, if I wasn't an illustrator I think I would be a full time teacher. Claire: What are some of Cambridge’s best kept secrets? Maisie: I think as Cambridge is very popular for tourists and visitors, there aren’t many places that are much of a secret! But I like walking along the River Cam and looking at all the boats on the left of me, and the trees and dogs on the right. There is a black bridge which goes over the River Cam near Jesus Green, which I call Spider Bridge because you see all the cobwebs at night covering the whole bridge and it looks great. Maisie: My favourite place in the world is Northumberland. We went on virtually all our holidays growing up in Northumberland. Usually we went camping there, which as a child is the ultimate holiday! When I was a teenager I was a bit grumpy about always going on the same holiday as I wanted to go and see new places, but now when I go to Northumberland and first walk on those same beaches, it’s an indescribable feeling. The paperback edition of The Happy Prince is available now.